And there we are again! The World Cup is in full swing with tons of goals, many surprises and my favourite team qualified for the next round. I couldn’t be happier! I transformed my office / studio into a multimedia control centre so now I can paint, post on Facebook and watch the games at the same time! Ha! 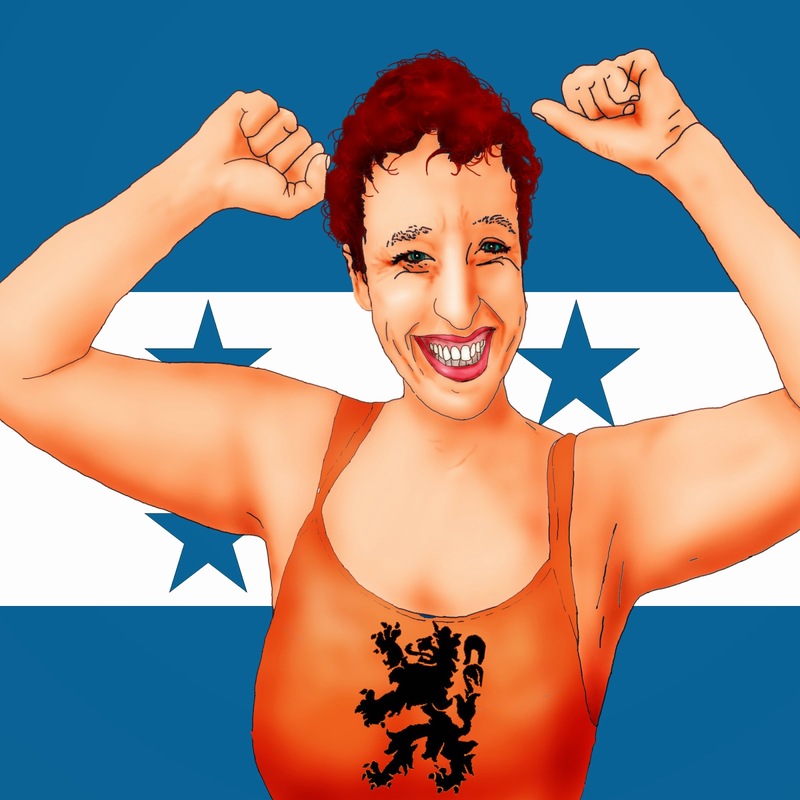 I sing the Honduran national anthem out loud (position 1, hand on heart) and mumble along with the Dutch one (yes, seventeen years in Honduras has left its imprints). I yell, swear, scream trilingual and upset my pets. Brazil 2014, I’m all for it! I do miss my football buddies. I’m pretty much settled since I moved from Copán, Honduras, to Antigua Guatemala three months ago. I’ve met a lot of amazing people and of course there are plenty of terrific bars and restaurants here to watch the games, but I haven’t found “my” scene yet. I also miss getting congratulated on the street for one of Holland’s achievements (as if I had anything to do with Van Persie’s dive) and the group of fellow supporters that root for Orange or at least pretend to do so when I’m around. Yes, watching football with friends in a bar is a lot more fun. But then again, it is also much more expensive. And I get a lot more work done watching the games at home, drinking tea instead of beer. Watching the Cup in Guatemala is quite a different experience from living it in Honduras. Not that the Guatemalans don’t live for football, they absolutely do. Even out on the street you don’t have to miss a beat. Every restaurant, bar store or market stall has a TV turned on, and if not, peoples’ cheers or swearing will keep you informed. But Guatemala is not one of the happy 32, and thus there’s not one team to nationally root for. Instead, people’s favourite teams are as diverse as the number of countries, with a slight and understandable preference for Central American countries such as Costa Rica and Honduras. That preference will shift soon depending on the outcome of the next few rounds, but staying home as close as possible is the norm. People might hate Brazil now, but if Brazil will have to face, let’s say, Holland, in the finals, then Latin America goes first. Understandable. I support Honduras, of course, because I feel so connected to the country after living there for so long. I never expected Honduras to win the Cup (or even the first round, but that would be a mean thing to say), but “my” team is, of course, Holland. Amazing, as little patriotic as I am, watching those Dutchmen fly over the field gives me goosebumps. Even sitting here all by myself at home surrounded by nothing but cats and dogs.